I don't see my kid-at-heart self letting go of stuffed animals any time soon. The average kid had a bunch but I had a small town of Stuffedville. Living in Wyoming for most of my kid life, we had a playroom in the basement with a walk-in closet that extended under the stairs. This room and closet along with our rooms were full of these cotton-filled creatures from thrift stores, vacations, gifts, zoos, and gift shops. There were puppets constantly used in a Johnny Carson esk show interviewing the guests from our collection that my father took over as a bedtime ritual. 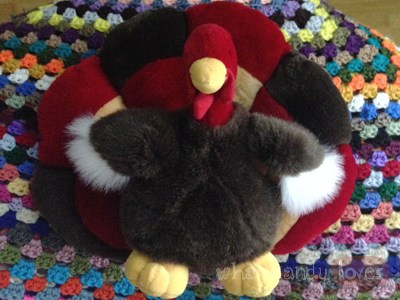 This turkey was thrifted long after I "grew up" as my only Thanksgiving decoration in the apartment. Turkeys are not exactly popular as anything cute or cuddly - we eat them yearly for goodness sake - but this one does a pretty good job in portraying cuteness. He goes well with my stuffed animal collection and in my living room with turkey day decor. 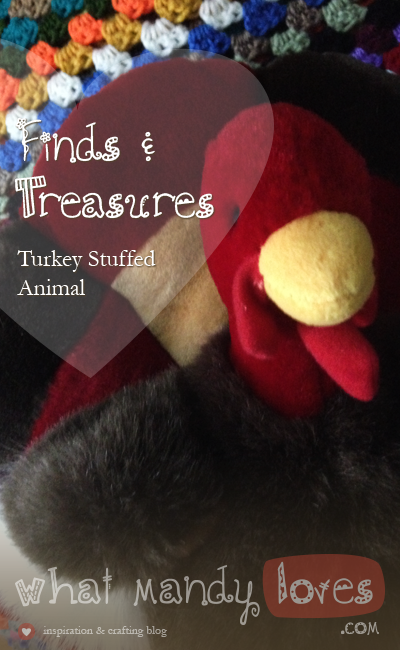 Do you own any unique stuffed animals or unique Thanksgiving decorations? Let me know in the comments.